This is what we had for our Meat Free Monday supper this week. I had been wanting to post this for ages, but had to wait for courgettes to come into season – then forgot all about it until I made it for supper last week. Prepare the veg, mix in with the olive oil, crushed garlic, and torn basil leaves, season and put in a roasting tin, making sure that all the veg are touching the tin. Season with black pepper and roast for 15 minutes until roasted – but not overcooked as you don’t want to destroy all vitamin C in the veg. While the veggies are roasting make your béchamel sauce. Melt the butter in a heavy bottomed pan. Add the flour and stir into the butter until well mixed. Allow the flour and butter mixture to cook through for 2 minutes. Gradually add the milk, mixing in well and keep stirring to prevent sticking and lumps. Once all the milk is added bring to the boil and allow to simmer on lowest heat for 2 minutes maximum. Take of heat and add 45g parmesan and pour into a measuring jug using a spatular to waste as little as possible. Take the roasted vegetables out of the oven and put in a bowl. In an ovenproof dish layer the ingredients. My daughter delegated the tasks that involved getting mucky hands to me. First spread quarter of a pint of the sauce on the base of the dish. Next add about a third of the roasted vegetables followed by third of the grated mozzarella and a layer of lasagne. 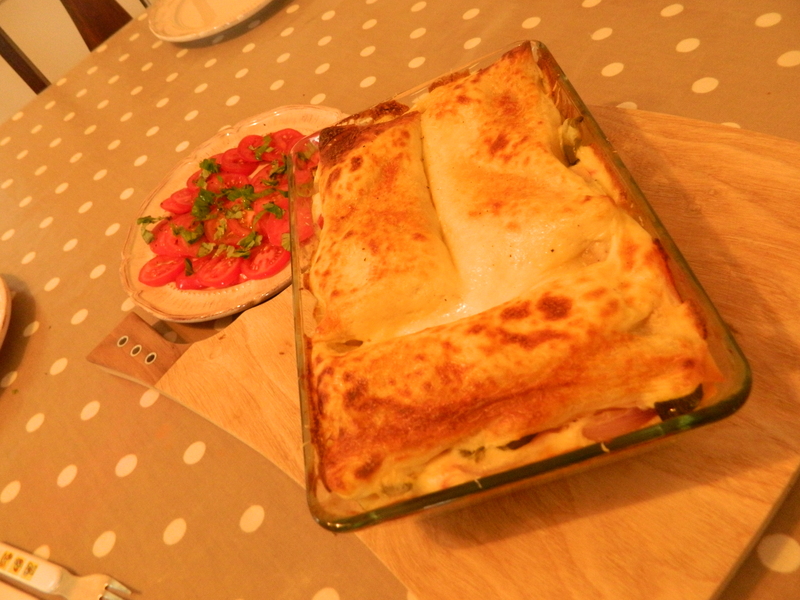 And then go through the same process until you have the top layer of lasagne topped with béchamel sauce. Put in the oven and cook at 180˚C/gas mark 4 for 30 minutes. This dish will is high in calcium, vitamin A, vitamin C, vitamin B6 and vitamin B12 – with the salad it also makes up 2 portions of veg. 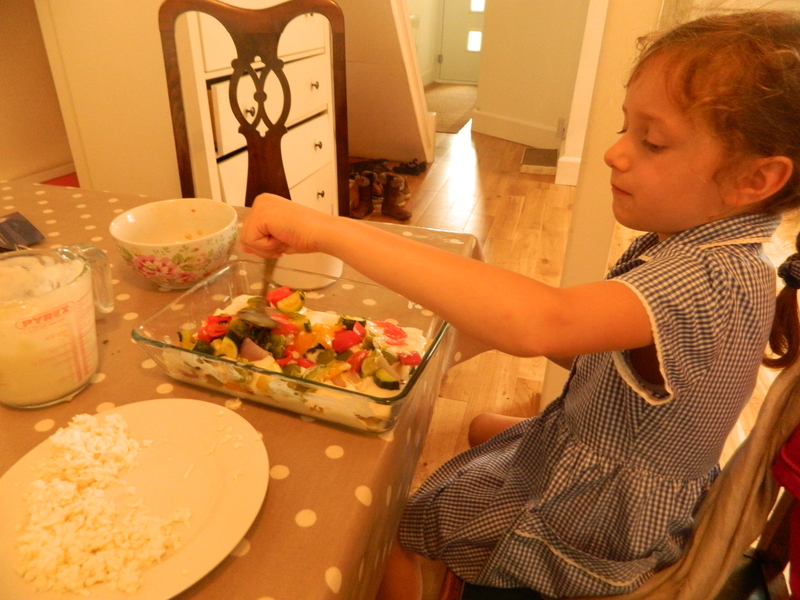 Oh and it’s cheap too – we’ve had it for supper two evenings in a row with tomato and basil salad the first night and wild rocket, tomato and avocado salad the second. 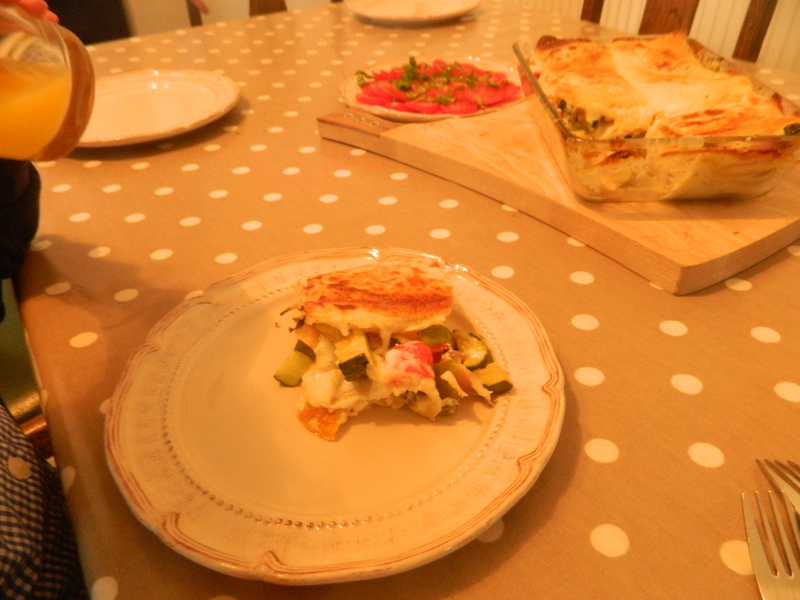 All the ingredients were organic (and British – the mozzarella was from Lavestoke Park Farm from grass fed buffalo) apart from the lasagne, red onion and wild rocket. For two night’s dinners it cost £10.50 or £5.25 for each evening meal – not bad.